Searchers from across the province look for Frances Brown who has been missing since Oct. 14. Oct. 20, 2017 3:30 p.m.
Officials have ramped up search efforts in Smithers, for a mushroom picker who’s been missing for almost a week. More than 19 different search and rescue groups from around B.C. helped look for 53-year-old Frances Brown Friday, who failed to return to her meeting place with her cousin on Oct. 14 in the Kitseguecla Road area. First Nations in the area have also come out to help and the Salvation Army is providing food and beverages to volunteers. There have also been searches from the air, plus different police dogs and a search dog from Williams Lake helping. About 25-50 people are showing up each day to assist in the search, based at the Rocky Ridge Resort. Since a possible campfire was left on Sunday morning by Brown, they haven’t been able to find anything else left behind from her. 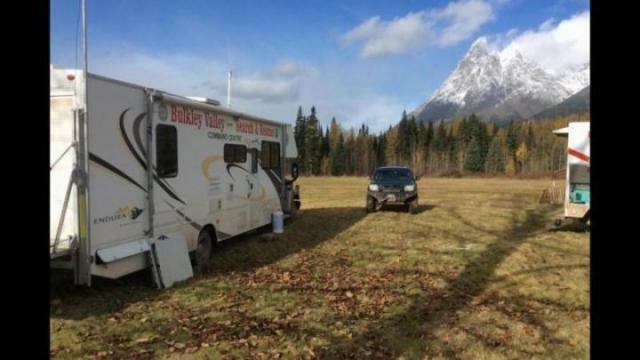 Whitney Numan of Bulkley Valley Search and Rescue (BVSAR) said the dense canopy is making the search difficult, adding that some volunteers on the ground have had to go on their hands and knees. “Under that canopy can have tremendous amount of brush. It is very slow going right now. It is slippery, wet and there is some snow in places. It is quite hazardous, everyone is wearing eye protection, gloves and have rain gear on it. They are looking under everything, because the person may have found shelter,” he said. BVSAR president Fred Oliemans added the search area is quite large. “If there is a team of four people, they have to be as close as two metres apart, so they are only covering a stretch of 10 metres in a line of a kilometre and then they turn around and do a grid like that. It takes a long time to cover a small amount of ground, and there is a lot of ground out there,” he explained. The search is well organized and very technologically advanced. Each day starts out with a debriefing. Where crews are assigned is decided the night before. President of Houston Search and Rescue Andy Muma said mappers look at statistical areas of probabilities, taking into account clues that have been found and areas already searched. They also take into account missing person studies and theories to get into the mind of the missing person. A map is drawn around the last known location with rings around it, and the further the rings are out, the less probable trackers will find Brown. “We use a book that has been tracking searches for years and produces statistical areas of probabilities, taking into account clues that have been found, areas we’ve already eliminated. Most cases we find people in those areas. It is amazing — the stats — how accurate they are,” he said. Every ground search team is given an iPad with GPS and a special program to aid in the search. The decision on how long to continue searching is ultimately left to the RCMP, in consultation with search and rescue crews. That discussion, which will also include Brown’s family, will likely take place this weekend. At 9:20 p.m. on Oct. 14, the Smithers RCMP received a complaint of a missing overdue mushroom picker in the Kitseguecla Road area. Frances Brown, 53, became separated from her cousin and did not return to their vehicle. The companion searched for Brown for some time before notifying the police. Smithers RCMP members responded and remained in the area with lights and sirens periodically activated in the hope Ms. Brown would focus on the origin of the light and noise. Brown is deaf in one ear. Bulkley Valley Search & Rescue commenced a ground search early Sunday morning and also commissioned a helicopter to assist. Brown has some back country experience, is in good health, was prepared with adequate clothing (rain gear, long johns, hiking boots) and has a lighter.